This PDF 1.3 document has been generated by PageMaker 7.0 / Acrobat Distiller 5.0 (Windows), and has been sent on pdf-archive.com on 07/02/2011 at 18:13, from IP address 180.215.x.x. The current document download page has been viewed 1062 times. File size: 45 KB (3 pages). Specialist Officers (ITSO) for its Global IT Centre and New Business Department. 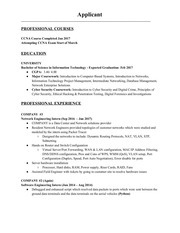 / IT or MCA preferably with Certification / Diploma / PG degree in Management in any stream. Age : Minimum 30 years and maximum 40 years. Relaxation in upper age limit for reserve categories as per Govt. of India guidelines. Scale V Officer. Also eligible for DA, HRA &amp; CCA as per rules in force from time to time. At present initial monthly emoluments at Metropolitan centre is approximately Rs. 55,000. Bill, and Servant allowance subject to ceiling. Inventory Management and empanelling and management of vendors. making and enhancing performance of assets. Risk reduction through standardization, proper documentation and loss detection. configuration support, procurement management, life cycle management. Up gradation and redeployment and disposal management. complex projects in banking and e-commerce space spread over different locations. than 300 servers and 2000 branch offices, with more than 1 lakh users is essential. Setting up and running of the Security Assurance function. Preparation of security organization structure, Information security policy and procedure. Base lining systems to secure policy. review and Disaster Recovery Plan review. and implementing the security policy. Application security testing and security audit for all bank applications. security problems and prevent, monitor, collect, maintain and measure security parameters. breaches and monitor and document corrective work to ensure compliance. Job Profile -• Ensuring that the DC and DRC meet the requirements of the Bank for all its applications. for ongoing DC and DRC. Security and audit compliance for laid out assurance procedures/standards. Optimizing and monitoring the services provided by Facility Management Companies. Bank’s requirements and ensuring that certification audits are conducted periodically. Setting up of green data centres. expert in IT Asset management having hands on experience in defining and managing SLAs. knowledge of CVC guidelines and other compliance functions. fixed pay and 30% variable pay. year of service. Reimbursement of monthly mobile charges upto Rs. 1000/- for call charges. Period of Contract: 3 years. The contract of engagement will come to an end with the expiry of said term. handled a large network in geographically spread out environment. • Implementation and service of networking technologies, platforms and products. • Coordinating and conducting DR related activities and Drills. with procurement processes under CVC guidelines. complex projects spread over different locations. • Ensure alignment between IT commitments and enterprise’s program and operation. • Manage and coordinate overall IT project delivery and resource utilization. • Maintain any project change of scope documentation and its impact. • Collect, codify and disseminate best practices to service delivery and project teams. • Collate, document and disseminate reusable components. knowledge management, repurposing and reuse. • Measure and benchmark IT team performance. Manage the project reporting requirements. of latest tools and estimation methodologies such as COCOMO, FPA etc. • Manage and co-ordinate overall IT development projects and resource utilization. • Maintenance of all change of scope documentation and its impact. • Implementing Information security requirement in soft-ware, Operating system, database, password management, encryption management etc. • Assisting in devising / Vetting Work-flow/ Architecture. • Coordinating with third party aggregators for host to host interface. • Assisting in Standardising message format wherever necessary. • Implementing reconciliation process through software. • Providing inputs on technology upgradation-both for soft ware and hard-ware. Candidate’s Name : Mr. / Mrs / Kum. Mr. / Mrs / Kum. * Tick whichever is applicable. Job Profile -• The candidate should have expertise in e-commerce/e-initiatives. development and identification of emerging trends. e-commerce are maintained at a consistently high level. functionaries for smooth functioning of e-Commerce activities. any communication in postal transit. prescribed format and is properly &amp; completely filled. format at the time of interview. Fee receipt issued by branch of SBI. Proof of age : copy of 10th or 12th marksheet/ certificate. Other relevant certificates applicable to the post applied for. vii. Attested copy of OBC certificate with non-creamy layer clause. PLEASE WRITE NAME OF POST AND POST CODE ON THE ENVELOPE. 8. Father’s / Husband’s Name: Shri. husband &amp; who is not re-married ? describing career, performance and experiences with supporting documentation. following papers. 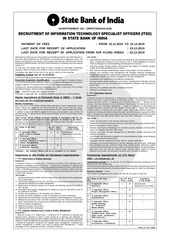 Last date for receipt of application is 15.12.2010.
anywhere in India including rural area. Both Signature &amp; Left Thumb Impression (LTI) are compulsory. (for farflung areas 22.12.2010) by ordinary post. This file has been shared by a user of PDF Archive. Document ID: 00028328.